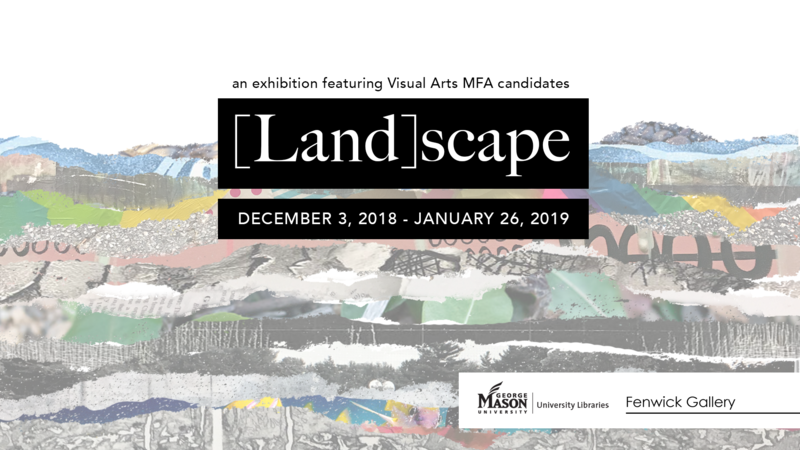 Fenwick Gallery at George Mason University is pleased to host [Land]scape, an exhibition of works by current MFA students in Mason’s School of Art. The exhibition runs from December 3, 2018 – January 26, 2019, with a closing reception and artist panel talk on Wednesday, January 23, 2019 at 5:00 p.m. in Fenwick Library 2001. What is a landscape? A scenic countryside? A long-standing tradition in art history? The distant backdrop of our lives and memories? In the exhibition [Land]scape, artists ask us to engage the notion of landscape on multiple levels. Some pull imagery directly from observed physical, natural, and built surroundings to construct narratives, comment on social, political, and environmental issues, or use landscape as poetic metaphor. Others explore the unseen spaces we navigate: the mind, dreams, fears, desires, the space between people, between the past and present, between here and there. Featuring a range of painting, mixed media, printmaking, sculpture, and video works, the exhibition itself becomes a landscape revealing a strata of emerging art practices. Participating artists include Jorge Bañales, Andrea Benge, Brigitte Caramanna, Danielle Dravenstadt, Kate Fitzpatrick, Emily Fussner, Kerrianne Hentges, Erica Hopkins, Strange Lens, Jennifer Lillis, Jayne Matricardi-Burke, Matt Nolan, Kevin Wallace, and Michael Walton. 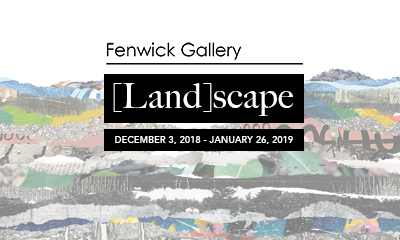 [Land]scape is presented by Fenwick Gallery in partnership with ARTIFACT, a graduate student organization for MFA candidates in Mason’s School of Art. ARTIFACT fosters connection, collaboration, and professional development within the MFA program and creates opportunities to share artists’ work with the Mason community and greater Washington DC area. About Fenwick Gallery: Fenwick Gallery is located in Fenwick Library on Mason’s Fairfax campus. The gallery is open during Library business hours; see the Library’s website at http://library.gmu.edu for the most accurate and up-to-date information. For additional information about the Gallery, visit http://fenwickgallery.gmu.edu/. For questions about this exhibition or Fenwick Gallery, contact Stephanie Grimm, Art and Art History Librarian, at sgrimm4@gmu.edu. This entry was posted in Exhibit, Fenwick Gallery, FYI, Graduate Students, News, Special Event and tagged Landscape by Jessica Clark. Bookmark the permalink. Copyright © 2019 News . All Rights Reserved.